A few thoughts on the FA Cup Final | "It's all about the Arsenal"
I got hold of two tickets for the FA Cup Final, however, as my Son was in the South of France, not due back till around 12 noon on the day of the final. Luke was travelling back by coach and ferry to Harlow – over seventeen hours of travel so I decided the trip to Wembley this year was a step to far. I made sure the tickets went to the best of homes, proper Gooners. I then decided just in case all went well and Luke was not too tired I’d get two tickets for the Emirates screening, being nearer and less aggravation than Wembley, but he was knackered and I’ve had a bad cold and cough, so we watched the game live on TV at home. This year I was as relaxed as I could be in the lead up for a Cup Final. I fully expected Arsenal to win against Villa. When you looked at the two teams, there was no comparison, Arsenal far better. The fifth match at Wembley for many of these Arsenal players in just over year gave me the feeling that they must all turn up at some stage. Strangely it was nice for a change not to be at the game and see all the things you miss when watching live. Arsenal were looking for back-to-back FACup victories (for the second time) and winning would take them clear in the all time winners list of FACup victories (12). Arsene Wenger was looking for his sixth win to equal Aston’s Villa’s George Ramsey. History was in the making . Szczesny, Bellerin, Mertesacker , Koscielny, Monreal, Coquelin, Cazorla, Ramsey, Ozil (Wilshere), Sanchez (Oxlade-Chamberlin), Walcott, (Giroud 76). Szczesny back in the side. Walcott starting above Giroud no doubt due to his hat trick against West Bromwich. Wilshere and Gabriel drop out from the West Bromwich match, Koscielny and Ramsey back in. Watching from home you sure got a sense the Wembley crowd being up for this final. Villa fans were in good voice, no doubt due to being their first final for many years. Arsenal fans countering the Villa fans. Then it was on to the pre-match Cup Final hymn and National Anthem. Something Arsenal supporters know very well. Help of the helpless, O abide with me ♬♪….. The team were then introduced to Prince William a Villa supporter. ♬♪ God save our gracious Queen! The referee blew his whistle and got the game under way. Ozil header, chance for Theo but he was offside. Villa chucked one into the box for Benteke, however, Szczesny is up to the job. Sanchez-Cazorla who crossed low and Villa conceded corner. Another corner which Koscielny won but could not direct his header. Szczesny again! This time punching clear from Bentekes’s head. That did him good. Cleverley went into the book for foul on Monreal. What a Save!!! Cazorla cross was met by Koscielny and his header is somehow saved by Given. Bellerin did well getting to the byeline, crossed for Ramsey but he could not steer the ball in. Magic from Ozil taking out two players, crossed the ball into the area and it broke kindly for Ramsey who somehow fires over. All Arsenal and should be leading. Again Cazorla-Ozil who fired a cross into the area and there was Theo, must be 1-0! No! Richardson with a super block keeps the score 0-0. Maybe Theo should have done better? Hutton booked for foul on Sanchez. Villa dead men walking here. Delph is now shown a yellow card as he pulls back Ozil. Monreal broke free down the left, crossed into Area and the ball was met by Sanchez who headed down into the area. In came Theo who took the ball waist height and slammed the ball past Given to give Arsenal the lead. No more than Arsenal deserved. First half went pretty much as I expected with Arsenal dominant. Villa not really offering much and failing to register a single shot on target. Second half saw an early chance for Ramsey but his shot was weak and an easy take for Given. Arsenal broke and the ball fell for Sanchez. Monreal made a good run to his left taking out the full back. Sanchez came inside thirty yards from goal and I doubt many knew what was going to happen next. After cutting inside Sanchez quickly looked up, showing intention for what was coming next in his head and fired in a rocket of a shot. The ball went up/down/left/right and flew past Given who didn’t move till the ball was nestling in the net. Given just sat there on the floor with a cheeky smile on his face which summer up the moment of magic he’d just been beaten by. On a day when the BBC were looking for viewers to vote on their best ever goal with five candidates, Sanchez should have been added to the list. Westwood taking time out from pimping his ride brings down Sanchez and gets a yellow card for his troubles. That’s four Villa yellows. Ramsey slide the ball into Walcott who shoots and somehow Given saved again and Jesus Sanchez heads in the rebound. It was given offside against Walcott but that was close. Villa were there for the taking. Bellerin now sets up Cazorla who twisted, turned, shot and there was Given again to save. Ozil sent Walcott away, this is Theo’s game and yet even just getting past Okore Walcott could not get a decent shot away and Given was on hand to cover yet again. Arsenal corner won by Ramsey. Cazorla floats the ball over and there is the unmarked Mertesacker to Joe Hart head & shoulders the ball into the net 3-0 Arsenal. Easy! Easy! Theo collected a pass from Ramsey and should have done better for 4-0 however, his shot curls way past the upright. That was goodnight from Theo as he was replaced by Giroud. Agbonlahor races towards the area and is caught by Coquelin and fouled, yet the referee waves play on. No way was it a penalty, but it was a free-kick. Of course the Commentators and experts had differing views, but that was more a case of a goal for Villa might make the last ten minutes interesting. Grealish is then in a tussle with Bellerin and both go to ground. Penalty they shout! Behave I say! Both players were off the field of play and so was the ball when Grealish touched it. No way a sodding penalty. Sanchez went off to great applause from the yellow wall and fully deserved. What a player, What a battler. What a great signing. Oxlade-Chamberlain came on to replace him. Chamberlain then found room on the right, hits a low ball into the area and there was Giroud to make it 4-0. Icing on the cake stuff. Overall this was as I expected an easy game. I do get fed up with the lazy journalistic view that if one side wins easy the other side were poor. For me this was more about Arsenal going at it right from the start. 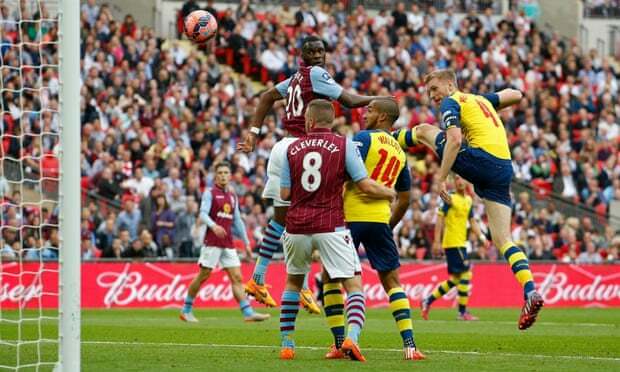 Aston Villa were not allowed to play, Arsenal bossed the game. That’s no slight on Villa, simply a fact of how the game was played. Arsenal have super play makers and if they play then very few teams can cope. However, if Arsenal players, play and take their chances, then in most games Arsenal will win. This is what Arsenal did. They played well, very well, dominated a Cup Final. I get this is not want some people (experts/media/journalists) want, but that’s how it is sometimes. Villa didn’t have a shot on target, that was due to Coquelin, Mertesacker and Koscielny who all gave Szczesny the early evening off. Nacho and Bellerin were superb. Every Arsenal player turned up and played to potential. Arsenal won a Cup Final without giving their supporters too much tension. No “we always do it the hard way” it was how fans like to win finals. Of course winning 3-2 coming back from 2-0 is superb and more exciting, however, Villa was simply seeing your team play to their ability and winning the game without the need for four or five heart attacks. So I say “Well played Arsenal, simply superb performance and fully deserved to win the FA Cup two years running. Congratulations to Arsenal Wenger for becoming the FA Cups most successful manager ever. Well apart from George Ramsey who was at Villa for about 100 years and won it when it was jumpers for goalposts. 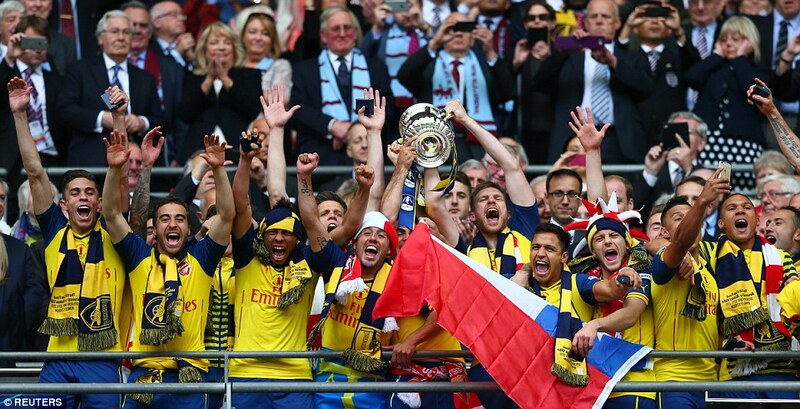 Congratulations to Arsenal FC for becoming the most decorated team in the FA Cups history with twelve wins. It was also nice to get our biggest ever win in a final.